1 tabbed for “Daily” Prayers – Select 3 people or groups of people that are closest to your heart to be in prayer for daily. Within this section of your journal, you’ll find 3 pages headed with “Prayers For…” and a small photo box for you to include a picture of each of these 3 loved ones. I have mine set up to pray for my husband, my children, and Throne of Grace. 7 tabs for “Weekly” Prayers (1 for each day of the week) – These sections can be set up as general or as specific as you want. 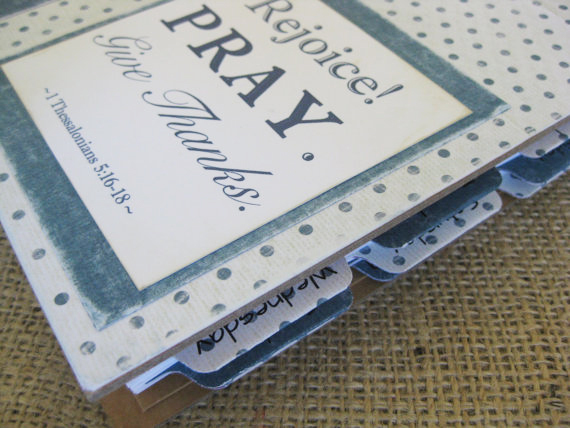 Within the days of the week tabs, there are 2 “Prayers for…” pages with a photo box. Choose 2 people, 2 groups of people, or 2 specific prayer requests for every day of the week to pray for on that day. For example, maybe Monday is designated as the day to pray for 2 missionary families, 2 close friends, or 2 unsaved family members. I could pray over my husband’s workplace for one sections and my children’s school for the other, or I could get specific and pray for two people in my life who need healing. It might be helpful to associate each day with something regular in your schedule. If your Bible study group is on Wednesday, maybe you pray for the people in your small group that day. 1 section for “Notes” at the back – These pages can be used in a variety of ways. Use them for sermon notes, for recording Bible verses, answered prayer, or even save them for spill-over if a section or two of the journal gets filled up quicker than others. With this set-up, you will pray over a total of 5 people, groups of people, and/or specific prayer requests each day. Keep your prayers simple so that you can continue to meditate on those prayers throughout your day and specific so that when the Lord answers, you will clearly see His work in your life. The idea is to cover a lot of ground without being overwhelmed by all the prayer needs. Some days when you have more time you might write half a page in each section, some days just a few lines, and maybe some days you just read through what you’ve already written and prayer over that! I hope these tips will help get you started leaving a legacy. The possibilities are really endless! We’d love to hear your feedback. 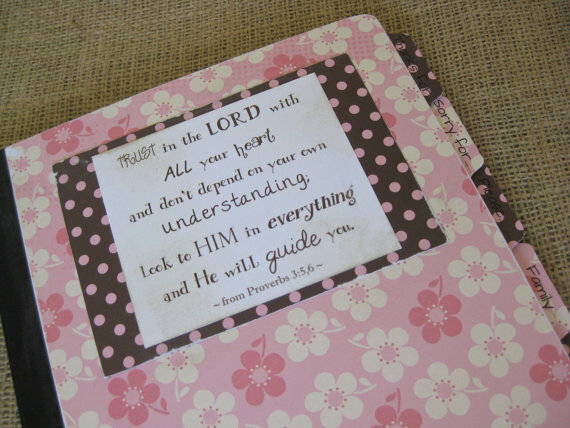 Share with us how you are making the most of your Legacy Prayer Journal or leave a question you’d like answered! “Thanks for…” – A section for praise and adoration of God and His faithfulness. Here you can record blessings, thoughts of gratitude, and answered prayers. “Please…” – Use this section to record your own prayer requests. What do you need or desire from the Lord? He wants us to ask boldly, meaning with a lot of faith, yet humbly – recognizing that He is God and we are not! Ask the Lord to help you line up your desires with His desires. “Family” – Prayers for your family members. “Friends” – Prayers for friends. “Others” – Prayers for anyone else God puts on your heart to pray for – teachers, coaches, pastors, neighbors, missionaries, our country’s leaders, even your enemies! Date your entries. What a blessing it will be to go back and have a record of your prayers and God’s answers! Keep your prayers simple so that you can continue to meditate, or think about, those prayers throughout your day. Keep your prayers specific so that when God answers, you will clearly see His work in your life. Don’t worry about how much you write. Some days when you have more time you might write half a page in each section, some days just a few lines, and maybe some days you just read through what you’ve already written and pray over that! 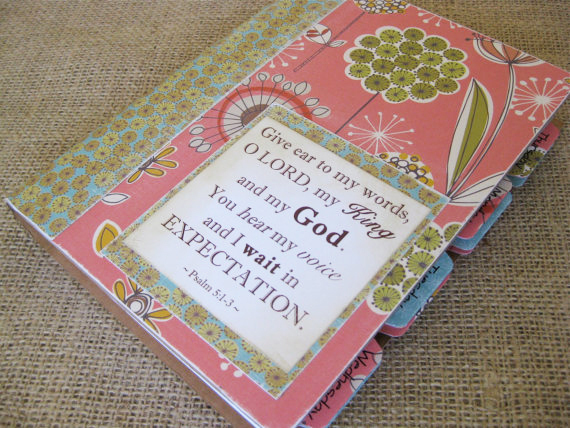 I hope these journals will help you start planting and growing little mustard seeds of faith! Before you know it, you’ll be a faithful prayer warrior! Awesome! Thank you so very much for this blessing. 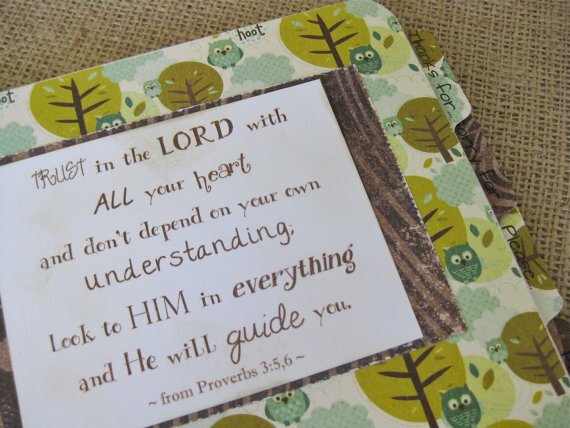 I lead our Ladies Bible Class and was searching for our next focus….through you God has given me our next classes. 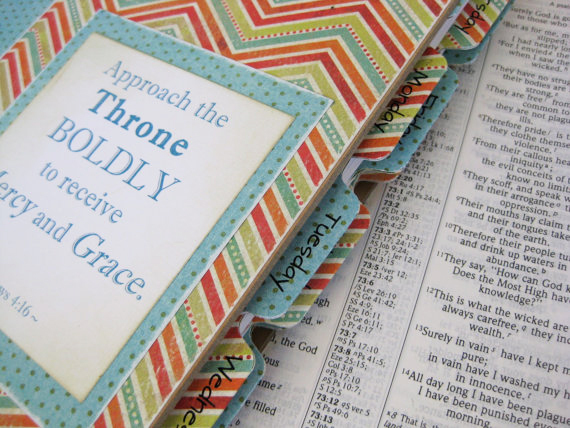 A study of prayer with the normal workbook replaced by our Prayer Journals. As a young woman in college I have a lot to pray for! This is such a good idea! thanks for sharing! I make prayer kits and the tips you gave just puts my custom kits over the top. I was wanting to know if you could list the materials you used. Hi Lavonna! I’d love to see the prayer kits you make. Glad we can bring a little inspiration! We use paper, plastic coil binding, cardstock, and chipboard in the making of our journals. You can find them for sale in our Etsy store at http://www.etsy.com/shop/ThroneOfGrace. Who sells the prayer books? Because I’m not a crafty person and would really like a great journal! Thank you so much. This is a blessing to me to have my prayer written down in such an organized way. That will help me pray in a more efficient way. Praise God. How did you make your tabs? So cute that they match the prayer book.